In the early 1980s, the heat generated in the absorption and dryingcircuits at the Kemira sulphuric acid plant in Helsingborg, Swedenwas lost into the sea next to the plant. Now, following a total reconstructionof the cooling system to include plate heat exchangers in a closed loopcooling circuit, the temperature of the cooling water has been raised toa level at which it can be used for district heating. 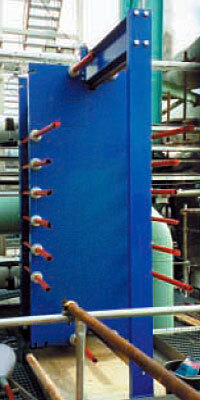 In early 1980s, Kemira changed its acid cooling system from direct cooling to heat recovery. In the direct cooling system, the heat from the absorption and drying towers was emitted to the sea. With the heat recovery system, the heat is instead transferred to a closed loop cooling water circuit containing demineralized water. This water is heated and the hot water is used to heat district heating water for the city of Helsingborg. By 1999, the lifetime of the anodically protected shell-and-tube heat exchangers had come to an end and they needed to be replaced. At the same time, Kemira decided to totally rework their acid cooling system. Instead of using three acid tanks (one for each absorption tower and one for the drying system), they installed one acid tank, supplying both the drying system and the two absorption towers with circulating acid. All the old coolers were replaced with three semi-welded Alfa Laval plate heat exchangers in D205 with FPMS gaskets, connected in parallel. The D205 plate material and the FPMS gaskets were selected due to the high acid temperature of 105 °C. Alfa Laval provides a complete range of plate heat exchangers with full counter- current flow and high turbulence. These units provide maximum heat recovery with a minimum of investment and installation costs. Full access to the heat transfer surfaces keeps service and maintenance costs to a minimum. Energy saving. Heat is recovered and delivered to district heating. Payback time less than one year. Nearly eliminated the need for cooling water.